Cozy and comfortable! I purchased for a full size bed but tried it on a queen size bed out of curiosity- this comforter is great fit for either size bed. The pillowcases are roomy enough for overstuffed pillows. Add traditional charm to your bedroom this season with the Edgewood down alternative comforter set by Eddie Bauer. This reversible down alternative comforter set features a handsome mini-plaid pattern on one side and a regular plaid pattern on the alternate side. The soft brush, micro-suede comforter set includes coordinating shams and is machine washable. This comforter is so soft and warm feeling. Heavier than a regular comforter, but not that heavy feeling you get with a traditional down filled comforter. The down alternative is perfect. I will say the color is definitely not red and white like stated, it is more of an rusty red with beige/ivory. I hope the photo helps with true color. It's beautiful and the smaller plaid on the other side is just as nice. Great quality, good name, great price. Bought this for my son's room. 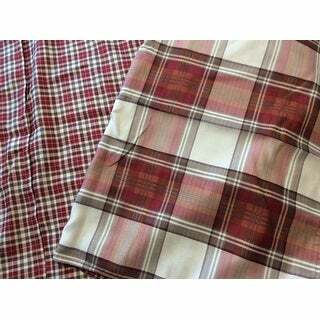 Have been looking for a brown/red plaid comforter for a long time. The underside is extremely soft and it is a good looking set. The only drawback to this comforter is that it has A LOT more orange in it that shows in the picture. I could tell it had a little bit but was surprised when I received it at how much the orange really comes through. It worked for us though so it was ok. The comforter is somewhat thin - but that is how my son likes them so this worked out for us too. But if you are looking for a thick, bulky comforter then you probably don't want this. All in all though this is a very nice looking set. Comforter looks nicer in the picture. The material is not user friendly as it seems to slip off the bed very easily. Very light fabric and slides everywhere; not cozy at all either. Hard to explain the material other than it kinda feels like suede but very light. After 5 months I've already purchased a replacement and do not use this comforter anymore. Do not recommend this product. great style with the comfort of down alternative. So pleased with my purchase! Great comforter set. Very nice plaid, lightweight yet very warm. Super price. This comforter is really great. Sized and priced very well, it fits the bed nicely, is reversible and washable. Nice weight to it: light and not heavy or uncomfortable, and warm enough for winter use. Seems like it will last for a while, because it's well made by Eddie Bauer. Cozy and warm! LOVE IT!! I really love this comforter. The colors are true and material is very soft! Keeps us warm. Good value for the awesome price. Love the look and feel of this set! It is super soft and warm. The set is pretty nice. The comforter is pretty thin but as a whole the set is pretty nice and I can't complain. As a side note not affecting the review. I ordered this product and overstock sent the khaki colored version instead. Same material just slightly different color. You can’t go wrong with Eddie Bauer products. It was made nicely, warm and comfortable, and easy to clean. Unfortunately it was so warm and comfortable, my dogs decided they needed to sleep on our bed too! This was a great purchase! Comforter light weight, soft and perfect warmth. My only concern is the quality of the stitching. With the Eddie Bauer brand name, I expected perfection. The fabric is lightweight, but warm without bulk. The pattern is bold and cheerful. Love it. I liked the colors and look of the comforter but I did not love the feel of the material. It might be just me because I prefer 100% cotton bedding. Wow! Love this set, so soft and comfortable really nice. Washed as soon as I got this and it washed really good! So glad I purchased this set. Now my son wants 1 in blue. The 3 piece set was very nice and warm for the winter months. The fact that it was reversible gave me a couple of options as well. I would recommend it. The colors are not even close to the photo shown. The actual colors are a muted rust and cream. It is a warm and soft comforter, but not a red plaid. As other reviews have stated this is more rust/burnt orange than red. It is thin, not a heavy comforter at all. Looks ok, but certainly a lesser quality product. "I see Red and White, but is the other color brown or more black/charcoal?" "Where is the matching bedskirt? What do people use for a bedskirt (we need a bedskirt). Also, which Eddie Bauer Bear pillow matches better.. the black bear or the gray bear? thank you!" I can't find the Black Bear in Nautica. Is it under a different name? "Is anyone using this on a queen bed? It seems like it won't be wide enough to cover the sides of the mattress." The full/queen should fit a queen size bed. We suggest getting the king size is you want more on the sides. I hope this helps. I love the quality of Eddie Bauer products.